Working as a 911 dispatcher can be stressful. The long hours with little to no breaks can be a lot for the body to handle. 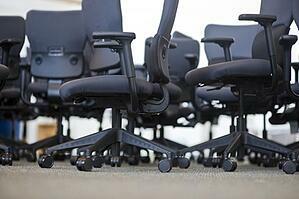 One of the best assets to help fight fatigue, back pain and low productivity is heavy-duty, 24/7 seating. Purchasing chairs for a multiple user, 24/7 environment is always a difficult task. It seems that there are always compromises to be made in comfort, durability or functionality. Where do you start? How do you know if what your buying is actually a 24/7 chair? Finding the answers to your purchasing questions is not easy, but with a few simple steps, you can get the most out of your chair buying experience. The biggest thing to remember when ordering chairs is to allow yourself enough time to make sure that you are making the right choice. Make sure that you have given yourself ample time to do all of your homework, research all of your options and demo any product you are considering.